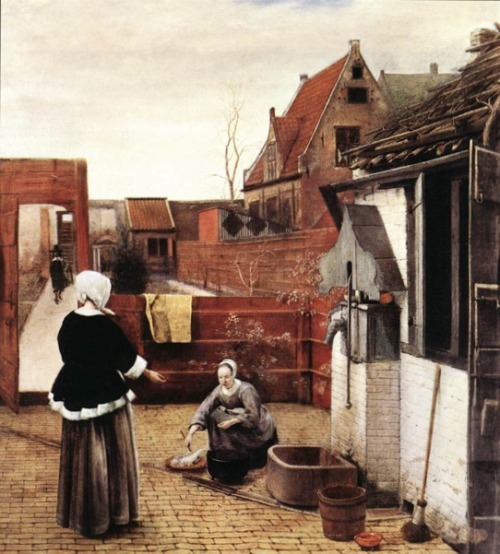 Pieter de Hooch gives us a glimpse into the courtyard architecture of his day, and just beyond the walls we get a glimpse of the cities of Delft and Amsterdam. This courtyard painting shows the nitty-gritty of the behind-the-scenes look at life in 17th century Delft. The women appear to be making some preparations for supper. The white wall on the right appears to be some kind of pump house. You can see the spigot for the pump directly above the large basin. Their is probably a cistern below the pump house because a drain runs through the courtyard and right under the pump house wall. We get a glimpse of a neighbor's house, but there isn't much we haven't seen in our earlier pages. What is new is the up close look at the out buildings associated with these houses. Somehow it is comforting to know that the rinky-dink sheds we erect for our gardening tools have a long an illustrious lineage. Here we get a better view. This courtyard is not for your hum-drum domestic chores. This one has fancy tile rather than brick and opens out onto the street. We can't tell too much about the house itself but we can clearly see the homes across the street. The most obvious thing that I see on these houses is the horizontal banding in white. It doesn't just happen at the break between the floors, rather the bands cut right through the middle of windows. 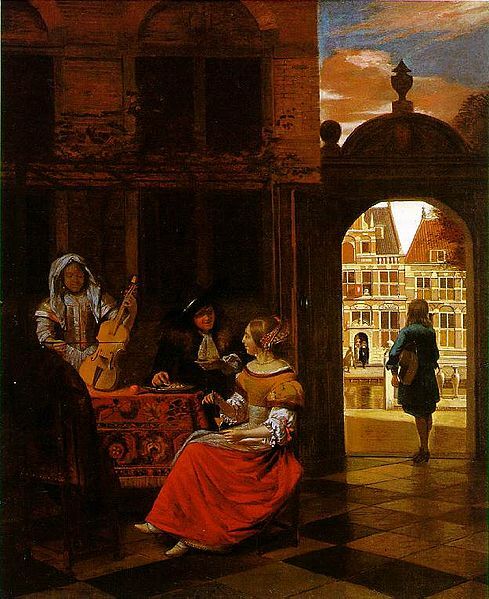 I have not seen these bands on other houses, but I think that this scene is from Amsterdam and the houses may have been fancier or simply followed a different style there. This intriguing courtyard architecture has a hallway that leads to the street. I find that curious. Why not just pierce the wall with a gate? Why bring a hallway back along the edge of the house? And why such a fancy hall? It has a high ceiling with oval windows bringing light in, but it seems like a grand expense if the only purpose is to provide access to the courtyard. I expect that it was done to improve the view of the house from the front. I cannot offer any proof other than the negative argument that I cannot find any other good reason to do this. Notice the polychromatic brickwork around the door arch. This is quite pleasing. Some would say overkill since it is only viewed from the courtyard. We can see identical banding in the arch in the house across the way. It appears that the white bands are not painted brick but some kind of stonework or cement blocks. The woman and child appear to have just come through that door. This might be an outhouse, or it could be access to a side street. I will vote for the outhouse idea. The floor is elevated. The waste was possibly collected periodically, so, rather than going into a deep hole it might have been collected in tubs. It is also possible that the wood bin on the right held lime. Witness the white on the brick wall. This would have been used to keep the smell and bugs down. Note also that the top of the building is ventilated. 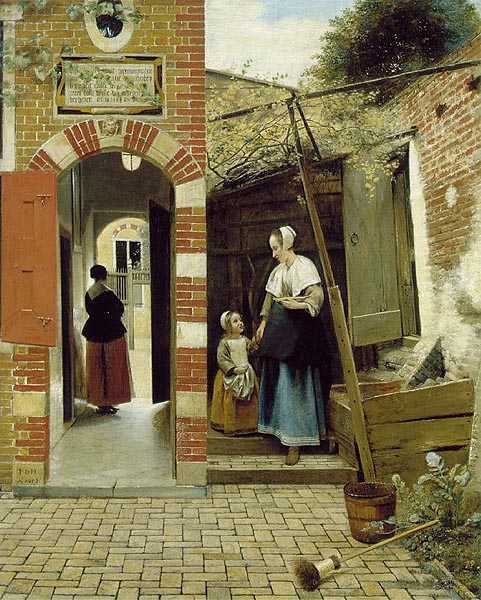 If my theory is correct then Pieter de Hooch should certainly be credited with painting scenes of everyday life. This is an indirect way of painting a delicate subject and I cannot think of any other painting where an outhouse is central to the story being told. This look at courtyard architecture concludes my foray into the world of art. We have seen some things that are strange to our modern eyes. It is unfortunate that we cannot go further back in time, but painting did not develop a great understanding of perspective until the Renaissance. We are indebted to the artists of the Northern Renaissance who decided that paintings of everyday life were as interesting as scenes from mythology or history. I hope that you have enjoyed what they have to offer. What do you have to say about this article and Houses in Art? Do you have a suggestion? Can you recommend a painting or an artist?